Family Spots and Films a Moose In Their Backyard. But Watch His Antlers Very Closely. Home » other » Family Spots and Films a Moose In Their Backyard. But Watch His Antlers Very Closely. Out of all the many animals in the world that you don’t want to mess with, moose should rank high up on the list. As much as they may seem like giant, gentle deer that graze all day long on shrubs, mosses, and plants, don’t let their vegetarian diet or appearance fool you. 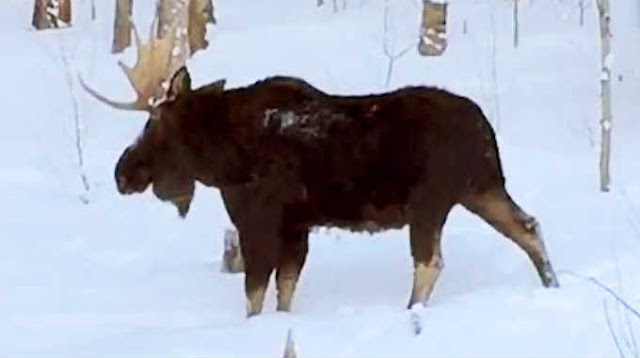 An adult moose can do a whole lot of damage if it feels threatened or in danger. Males in particular are very territorial and aggressive, especially during mating season. That’s why if you ever stumble upon one in the wild, it’s recommended that you avoid looking it in the eye or stomping your feet. In fact, it’s best to not make any noise and quietly back off to a safe distance if you’re able to because they can run at speeds as fast as 35 mph and won’t hesitate to use their antlers to fight! The bony paddle racks that males sport are one of their most impressive physical features and rightly so. Bull moose depend on them during mating season to both attract a lady moose and dominate younger rivals. The larger the rack, the more intimidating, the sight alone is usually enough to scare a less endowed bull moose off. Towards the end of the year, as mating season comes to an end, males begin to shed their antlers and what you see in the accompanying video occurs. This is an extremely rare sight that was captured on home video by a lucky family who live near Laramie, Wyoming. As you can see, the moose was wandering around in the snow outside their house foraging for food to graze on. He stopped to have a look around and shook his head while standing with his back to the camera. That was when one of his antlers literally fell off his head and dropped to the ground. According to Kim Eberhart, who lives at the cabin and witnessed the rare event in person, “The moose shook his head and his paddle fell off right in front of us! It was amazing.” It really is something special and you simply have to see this for yourself because it’s so cool. Check it out and hopefully you learned some new moose facts that you can use from this!